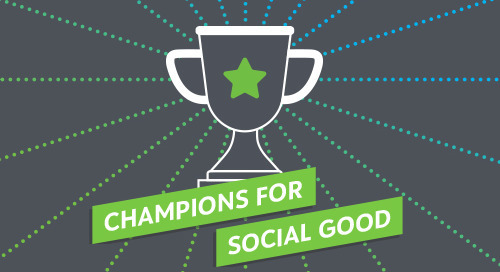 In this episode of the Champions for Social Good podcast, Rachel Hutchisson (@RachelHutchssn), vice president of Corporate Citizenship and Philanthropy at Blackbaud (@blackbaud), speaks with Daryl Brewster, CEO, and Carmen Perez (@CarmenJSPerez), Director of Data Insights at CECP (@CECPtweets), about the continued evolution of companies being a force for good in solving societal problems. Daryl talks about CECP’s core belief that a company’s social strategy determines company success, and how its flagship research report, Giving in Numbers, helps inform CSR strategies for companies across the US and around the world (including at Blackbaud, as noted by Rachel!). Daryl and Carmen dive into key insights from CECP’s most recent Giving in Numbers report, the largest in-depth research and analysis of corporate societal engagement with data from over 250 of the world's largest companies, including: a substantial increase in corporate investment in culture and arts over the last few years; deeper integration of business and employee programs; and a rise in the number of companies offering employee choice for matching donations and volunteering. Carmen also highlights how the Giving in Numbers report can uncover some very interesting industry-specific insights, such as how subsections of the healthcare industry are on opposite ends of aggregate changes in corporate giving. Rachel, Daryl and Carmen also discuss some global trends in CSR, and how companies around the world can learn from each other to make a greater impact. After listening to the episode, read Daryl’s article in our new eBook “CSR 2020: Experts Look Ahead” to learn about the future of business pioneering solutions to the world’s greatest problems.